Separate whites from yolk. Mix whites into steep foam. Add sygar in few stages, continue mixing whites till state of «steep foam» (when you turn dish with upside down whites, they do not pour out). Mix yolks, add to whites and sift flour. Stir dough with spoon and spread in form, cover bottom with paper. Bake at 180 ℃ for 20-25 min. Remove from form, cool it. 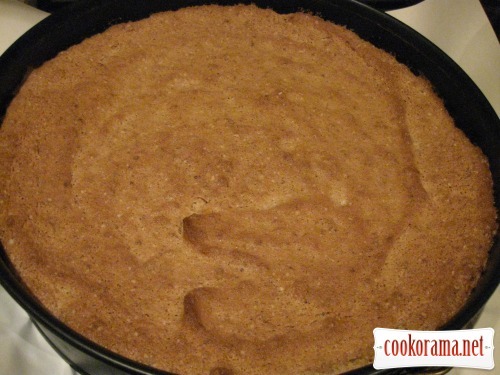 Put biscuit in split form, to pour soufflé on top gently. Soak gelatin with juice for swelling. 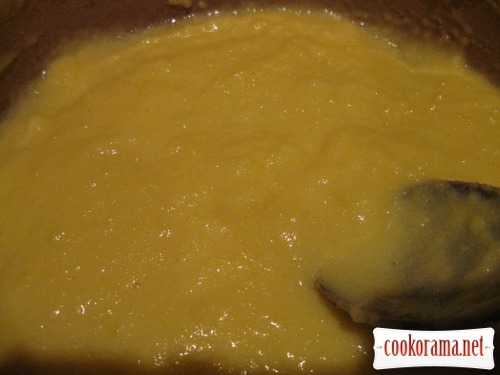 Mix yolks with half of sugar, add flour ad milk, boil on water bath till thickening. Cool egg mixture. 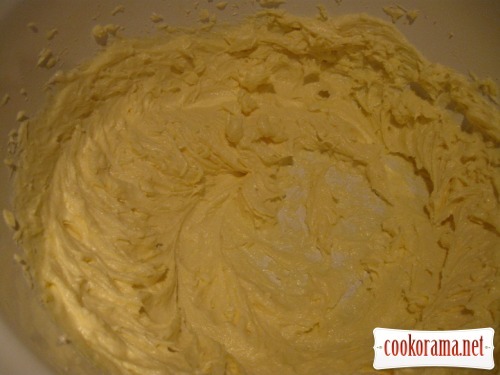 Mix butter and continue mixing, add egg mixture in few stages. 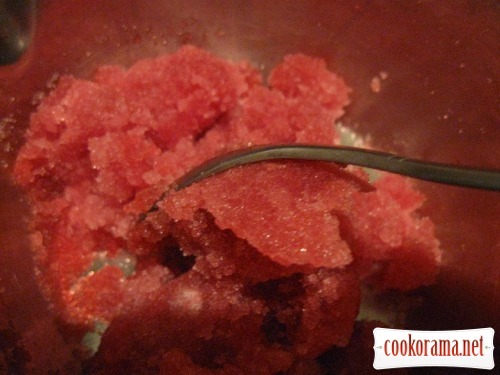 Mix whites, add rest of sugar (steep foam), melt gelatin and mixing whites, pour gelatin. Combine both masses and quickly pour on biscuit, smooth it. Put in the fridge for about 3 h.
Melt chocolate on water bath and pour cake with it. And again in the fridge. 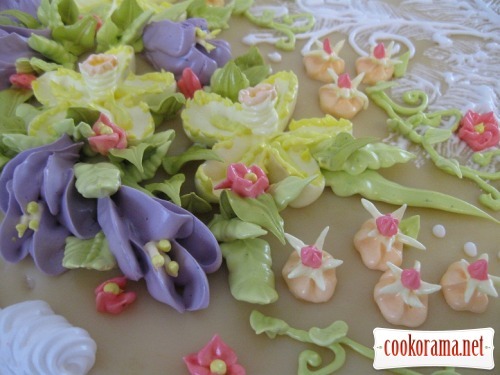 Prepare white custard for decoration. Mix whites into steep foam. From water and sugar boil syrup till sample on the solid ball, at the end of cooking syrup add citric acid. Mixing whites, pour a thin stream of syrup. The cream will increase in volume and becomes warmer. 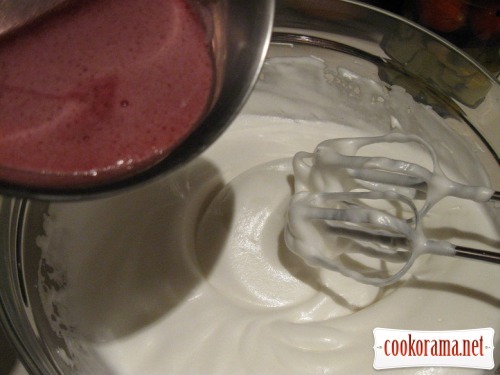 Put a bowl of cream into cold water and continue whisking until cooling. 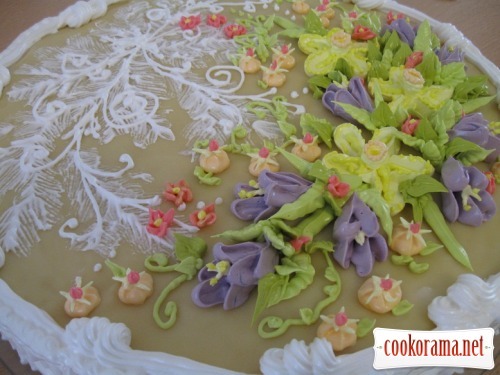 Smear side of cream with white cream, smooth and decorate. Put in the fridge. 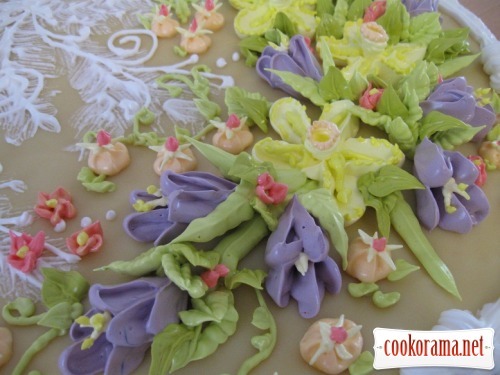 Color 1-2 tbsp of cream into yellow, green, purple, pink, orange color. 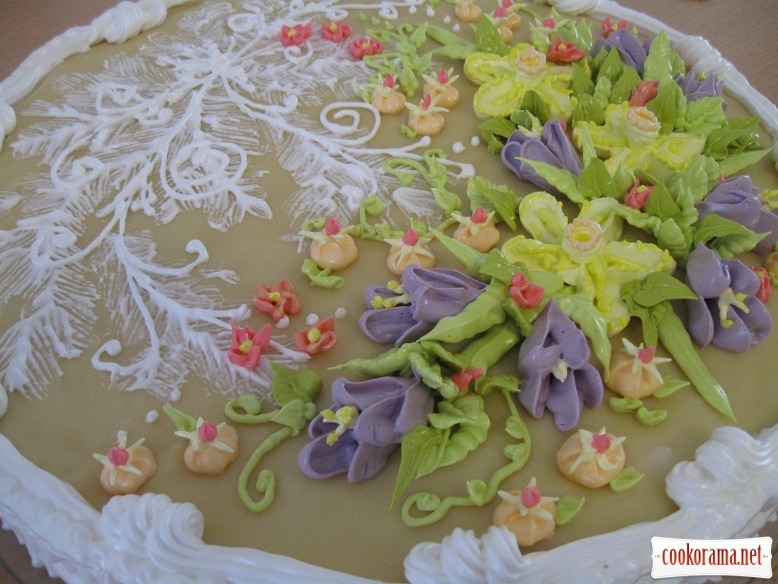 With white cream draw on the cake thin strips and smear with brush, simulating frozen glass. And then I drew daffodils, crocuses, leaves and small flowers. And again in the fridge for some time. 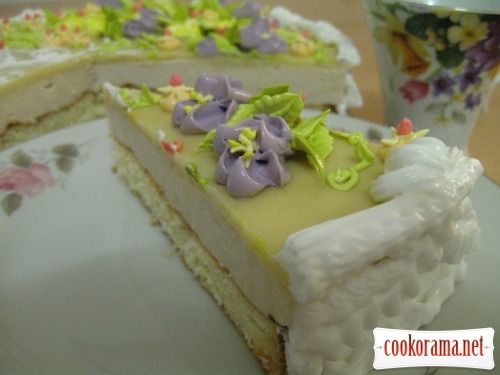 Top of recipe "Cake "Spring""
Ех, краса і смакота! Це уже в повний хід пішли нові насадки від Вілтон? Насадками справді класно працювати. Тільки не так швидко, як я бачила на ютубі . Треба ще освоїти прикрашання масляним кремом. Вау! Яка краса!!! Це початок березня — ще мороз малюе вiзерунки, але вже квiти пробиваються!!! Браво, Оля!!! Очень красиво, оформление просто супер!